This was the first of two performances, and the first "repeat" of this festival, as 2001 had been featured as the opening movie when the festival launched back 2013. Here, the orchestra was led by conductor André de Ridder and joined by the men and women of Musica Sacra, regimented into two small choruses positioned in box seating in the first tier of David Geffen Hall. 2001 was birthed a collaboration between Stanley Kubrick and the late science fiction author Arthur C. Clarke. (The novel was written in parallel to the screenplay and expands on some of the more cryptic moments in the film.) It is an unusual film in every respect: meditative, slow-paced and presenting its images and skeleton plot with a minimum of dialogue. And its score, which featured music by Richard and Johann Strauss (no relation) and the choral music of Gyorgi Ligeti, is actually made from Mr. Kubrick's temporary music cues used during production. An actual score was written (by composer Alex North) but was never used. The plot of 2001 concerns a series of interactions between humans (at various stages of development from primitive hominids to space-faring scientists) and an alien presence represented by a mysterious black slab of unknown material and origin. 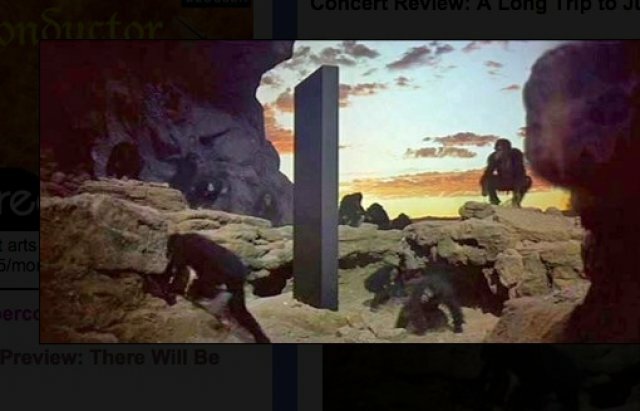 This one-by-four-by-nine shape (commonly referred to as "the monolith") is many things: a cryptic teacher that shows the Australopithecines (pictured above) how to use tools, a signaling device, and at the film's climax a cosmic gateway that transits astronaut David Bowman to a locale best described as "beyond the infinite." Also sprach Zarathustra (commonly known outside the provenance of the music business as "the 2001 theme"), The Blue Danube waltz by Johann Strauss Jr. (no relation) and the slow movement from Khachturian's ballet suite Gayaneh appear in between the scenes with dialogue: serving as majestic, playful and serene accompaniments to the momentous movement of spacecrafts and satellites. The music of Ligeti (Aventures, Atmosphères, part of the Requiem and Lux Aeterna) accompanies every time the alien influence (in the person of the Monolith) shows itself. It could thus be argued that the excerpts used here from these four Ligeti pieces provide not just exotic accompaniment for the strange journeys and psychedelic ending of this film: but they give the listener a sort of primer in terms of how to experience and listen to the music of the 20th century. In that, the act of screening 2001 is a valuable thing in and of itself: teaching the audience and showing the power and beauty of works that, were they programmed on a regularly scheduled concert, might draw less of an enthusiastic reception.